Status: physically open and legal work all completed. This path runs from Rectory Lane to the B556 Ridge Hill. The route forms part of the historic St Albans Road which became the A6. As the A6 became busier, a new A6 route was constructed to the east, and this route became a side road. In 1965, the A6 was made a clearway by the Minister of Transport, and it was decided that motor vehicles should not use the old route to join the A6 trunk road. As the road fell into disuse by motor vehicles, its surface started to be covered by leaves and mud so that to a casual observer it was impossible to tell the difference between the roadway and the land either side. When the M25 was constructed, the builders forgot to leave an access for the non-motorised users to join the B556 (old A6). The route was reopened by the Highways Partnership (Hertsmere Borough Council and Hertfordshire County Council) on 14 Jun 1997 after pressure from the BHS local access officer, as it was needed for the H25 London Orbital Bridleroute. The reopening meant that half the length of the B556 could be removed from the H25, so improving safety and enjoyment of the H25 route. In 2010, the County Council's rights of way department improved the surface of this route and its extension, to make a route that would be usable all year round. In 2011, the route to the north west was dedicated as a highway by the landowner. The London (Prohibition of Wating) (Clearways) (Trunk Roads) Regulations 1965 prevented use by motor vehicles, so that they couldn't join the A6 by this route. Definitive map modification order application made, 7 Feb 94, certificated 10 Jun 95. Old St Albans Road runs from its junction with Rectory Lane at TL 2037 0239 approx 15 metres gnerally NW to join Shenley RB 40 at TL 2035 0240 on the parish boundary. 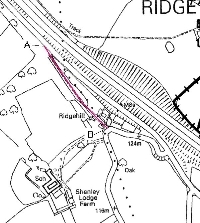 Width: Varying between 6 metres and 12 metres as shown shaded on the plan forming part of the Hertfordshire County Concil (Ridge 38 & Shenley 40) Modification Order 2011. Old St Albans Road runs from its junction Ridge RB 38 at TL 2035 0240 on the parish boundary continuing approx 280 metres generally NW to TL 2019 0262. Width: Varying between 4 metres and 30 metres as shown shaded on the plan forming part of the Hertfordshire County Council (Ridge 38 & Shenley 40) Modification Order 2011. © 2011 Patchetts Green Bridleways Trust. File reference: EC083.